When most people think ‘Amish’, the first place that comes to mind is Lancaster County, Pennsylvania. The Keystone State is home to many more Amish besides those in Lancaster, however. With 53 total settlements, Pennsylvania leads the nation in number of Amish communities (see Amish Studies site). Lancaster County is home to the oldest (founded circa 1760) and largest Amish community in the world, with 179 church districts as of 2010 (see Amish Studies website for more on Amish populations; Lancaster vs. Holmes County, OH size ranking also explained here). The Lancaster community includes over a dozen congregations located in neighboring Chester County. Lancaster County Amish drive grey-topped buggies. Nearly all Lancaster church districts are considered to be of the same affiliation. There is some variety of practice and technology among districts, with more conservative Amish generally living in the southern half of the settlement. Lancaster Amish are considered to be among the more progressive when it comes to technology allowed. Farming remains important to Lancaster Amish, though population pressures have limited agricultural opportunities. Some Amish have begun small-scale produce operations, suited to labor-intensive agriculture on small plots of land. Business has been another way Amish have made a living in the face of high land costs. Small business is very important in the Lancaster Amish economy, with an estimated 2000 Amish-owned companies. These include manufacturers, builders, quilt makers, furniture shops, market stands, and a variety of others (read more on PA Amish furniture). Lancaster Amish have also formed numerous daughter settlements in states such as Wisconsin, Indiana, New York, and Maryland. Lancaster County is by far the most heavily-visited Plain community, and has developed a thriving tourist industry. Some Amish participate in tourism, either operating businesses selling product to tourists, or in some cases catering directly to tour groups. Tourism is controversial among Amish, with some seeing it as detrimental to the community, and others considering its positive side in the economic support it provides. Lancaster County became known to the world after the tragic schoolhouse shootings of October 2006, in which five Amish girls died, and five were wounded, at the hands of a disturbed gunman. The Amish response of forgiveness became a headline story around the world which inspired many. 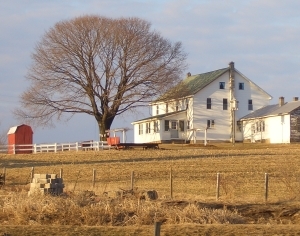 Lancaster County is also home to a large population of Old Order Mennonites, who populate the northern end of the county, near Ephrata and its environs. Old Order Mennonites are distinguished from the Amish here by their black-topped buggies and bicycles (local Amish primarily use push-scooters instead). Also know as “Team” Mennonites, this group has maintained a stronger connection to farming than the Amish, and rely more heavily on tractors as well to manage and work the land. Old Order Mennonites and Amish cooperate on education and operate joint schools, attended by children of both groups. 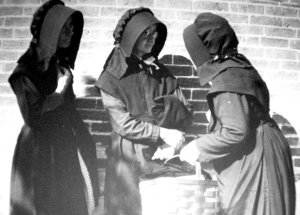 Old Order Mennonites also distinguish themselves in the style of plain dress worn, and by the allowance of public electricity and telephones in the home. Pennsylvania is home to the well-known settlement at Kishacoquillas Valley, also known as ‘Big Valley’. Big Valley is exactly that—a 30 mile-long by 5-mile wide valley, which is home to three distinct groups of Amish—the so-called Byler, Renno, and Nebraska groups. These groups are most easily distinguished by the coloration of their carriages—yellow (Byler), black (Renno), and white (Nebraska). The Nebraska Amish are among the most conservative in Pennsylvania and in Amish society as a whole. There are various theories as to the reason for the unusual color patterns of the carriages here. Big Valley is distinct in its diverse Amish population. Big Valley is the third oldest of all Amish settlements (founded around 1791) and is home to around 30 districts spread across its three main affiliations. Belleville in the center of the community is home to a well-known auction building, where Amish and their neighbors trade livestock, share meals, and chew the fat. Big Valley remains largely off the tourist trail due to its fairly remote location. The small college town of New Wilmington, north of Pittsburgh, is at the center of a quite conservative settlement of Amish. The New Wilmington group is the 4th largest in the state, with approximately 3,000 Amish in 18 congregations as of 2010 (see Amish Studies). The New Wilmington Amish have origins in the Big Valley settlement, specifically with Big Valley’s Byler group. The New Wilmington Amish directory describes members of the community often traveling between New Wilmington and Big Valley on foot—a distance of 250 miles lasting 5 or 6 days. “Byler” is by far the most common last name in the New Wilmington community. Travelers in the New Wilmington settlement will likely notice two distinct colors—the unusual burnt-orange hue of the buggies, and the preponderance of blue—nearly all Amish doors are painted a sky blue, and local Amish stick to wearing shades of blue and purple. New Wilmington is the only surviving Pennsylvania community founded in the 19th century (1847). The area of Smicksburg in Indiana County is home to another settlement of Amish of a similar size to New Wilmington (18 church districts), though it was founded over a century later, in 1962. Amish here drive Midwestern-style black buggies. Another distinct Pennsylvania Amish settlement can be found at Somerset County in the south-central part of the state on the Maryland border. Somerset is unusual among Pennsylvania settlements and in fact among nearly all Amish communities in that it is home to one of the only groups of Amish who hold Sunday service at meetinghouses, rather than practicing home worship. Founded around 1772, Somerset County is the 2nd-oldest Amish community in North America. Despite its nearly 240-year history, this settlement remains tiny compared to Lancaster County, with a mere 5 church districts. Pennsylvania is also home to a large number of smaller, off-the-beaten path Amish settlements. The Lebanon County (1941, 6 church districts) and Dauphin County (1978, 8 districts) communities are two Lancaster daughter settlements located in neighboring counties to Lancaster. The sizeable Juniata County Amish settlement (1950, 7 districts) has roots in the Big Valley community, a spin-off Renno Amish community. The Sinking Valley setllement also consists of settlers from the Big Valley settlement, making up a single church district in an isolated valley a dozen or so miles west of the home community. 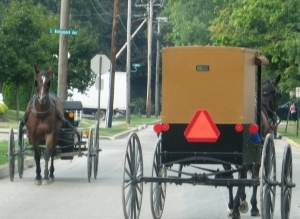 Crawford County is remarkable for being the county containing the greatest number of individual Amish communities, with a total of 7 as of 2008 (see Amish Settlements Across America: 2008). Significant settlements in this county include the community at Atlantic (1924, 6 districts), Spartansburg (1966, 9 districts), and Conneautville (1969, 3 districts). In Clearfield County, a stone’s throw from the town of Punxsutawney (of Groundhog Day fame), one finds a good-sized Amish settlement of 8 congregations. The only PA Swartzentruber Amish community is found in Cambria County. Dozens more Amish communities, many just one or two congregations in size, can be found throughout Pennsylvania. Pennsylvania is home to a wide variety of Amish settlements, ranging from the very conservative to the more progressive. Lancaster is clearly the state’s most prominent community and will continue to be so, despite having faced skyrocketing land prices and urban encroachment in the latter half of the 20th century. Though there has been significant out-migration in recent years, Amish continue to form new settlements in Pennsylvania, with a number being founded in the past decade. Pennsylvania and Ohio have long been considered the foremost states when it comes to the Amish. The two states have nearly the same amount of settlements and total Amish population. Additionally, the Lancaster settlement is nearly identical in size to the large Holmes County, Ohio Amish settlement. Ohio is home to a larger number of individual congregations, however. Pennsylvania congregations tend to be larger on average. Despite their similarities in size, in the popular imagination, Pennsylvania remains the state most readily associated with the Amish, and Lancaster the best-known and most heavily-visited community. I grew up in Atlantic, PA (Crawford County). It’s exciting to see my tiny village on this site. 🙂 As a matter of fact, my parent’s home has Amish across the street, kitty-corner, and the biggest of the 4 different schools is only 3 houses down from their place. It was a great place to grow up. It’s easy to tell when friends and family come up from New Wilmington- the brown buggy tops are a dead giveaway! Atlantic also has it’s own auction in the spring and several new “bent and dent” stores have sprung up in the past few years. Nice to hear from you Amanda. I almost made it up to Crawford Co this summer but not quite 🙂 Lot of Amish communities in that county. Where is Crawford County please? I believe Titusville is located in Crawford County and I will be there for only two days. I would like to visit the Amish Communities while there next week. Please email and let me know asap. I fly in next week. Thanks so much! For Margorie, who asked where Crawford County was… Crawford County is in northwestern Pennsylvania, south of Erie County (where Erie is located). The county seat is Meadville. Yes, there are Amish around Titusville. In fact, besides downtown Meadville, and perhaps downtown Titusville, I can’t think of an area of Crawford County that does not have an Amish community. We have several flavors of Amish communities from three New Order Amish communities near Conneautville, Troy Center, and at the Mercer County line near Jamestown; with the remaining parts of the county as Old Order; with a small Nebraska community along the Ohio state line near Pierpont and Linesville. Farming, small business, and the timber industry prevail throughout. There are Amish owned greenhouses, excavating companies, and flooring and countertop businesses, as well as several Amish run stores from Old Order to New Order. 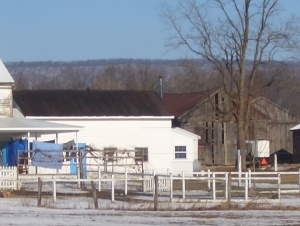 A large percentage of Amish farms in this part of the state have gas wells, which provide heat and extra revenue to the farms. My Fathers family grew up in the Atlantic Pa. area. He still has relatives living there today.He was the son of William (Bill) Fisher. My grandfather passed away when my father was a teenager.Granddad fell from the roof of a barn and died in his sleep the next morning. My grandmother was a Wengerd and this is the part of the family that lives in the Atlantic region yet today. Grandmother remarried yrs. later to Bishop Andy Hershberger and lived in Troutville Pa. until Andy’s death. Then moved here to NE Ohio to live with my dads only sister.Grandma died there of complications from Alzheimer’s disease.She was buried in Atlantic Pa.I have many wonderful memories of both Atlantic and Troutville Pa.
Betty I appreciate you sharing. I was very near the Atlantic community last summer but unfortunately did not have time for a visit. There is a book out there on the history of the Atlantic settlement I believe. My grandfather sold “bootonware” (plastic serving ware I believe) with a Mennonite man named Mr Fisher, my father would talk of this family and as a little girl I would visit them. I would love to find this family and reunite!! Any help would be appreciated!!! excited to see info on my new neighbors from smicksburg… they have started a new community here in upstate ny! and more are moving in all the time. they have revitalized this community. they have reclaimed the abandoned farmland. it has certainly been an interesting year learning their ways, etc. from them. i have gained many close relationships which i hope will last a lifetime. Hi, my name is Sofia and I have been studying the Amish culture for a long time now. This Feb I will be travelling to Penn so that I can finally go visit one of their communities, but I was hoping I could have a less touristy experience and stay with a family instead of staying at a local inn. I really want to get to know the Amish and their lifestyle, and maybe even find someone to correspond with me. Any good tips on which communities’ bureaus I should call first to try and set something up? I have done some research already and it is as hard as I thought it would be to find any valuable information. Try contacting Professor Donald Kraybill at Elizabethtown College in Elizabethtown PA. I am sure you wll be able to find his email address on the colleges website. He may be able to give you some advice and insight on the Amish communities here in Lancaster County. My Amish neighbor heard at church yesterday, that someone made an attempt to harm the children again at Nickel Mines School. The guy was supposedly arrested inside the school, and taken to jail She was wondering if this really happened or perhaps only a rumor? or if it did indeed happen?? Brenda a little late here but I have not heard anything about this, I think it must have just been a rumor. I’m Interested in visiting an Amish Community/family (with my wife and 3 year old daughter)that is not turisty. How would I go about this? I also would like to visit & stay with the Amish. I continue to discover(genealogy)my Mennonite roots in Lancaster County, PA. Hopefully, when I do locate my relatives in the area I will have the opportunity to meet with them in the near future. Also thank-you Kendal for the information. hi, how fortunate would i be to have a penpal in Amish PA? I know a lot about the Amish lifestyle and Faith 🙂 …. I am interested in connecting with a PenPal, Personally to really learn more about their way of life and possibly see a door open up where i could stay with them for a little while. I have a warm, friendly personality, and Love God, too! I love the fact that the Amish are sincere about being Modest! 🙂 And, too, it has been a desire of mine to learn to live on and work a farm! …. I look forward to an open door, God Bless! I HAVE BEEN STUDYING THE AMISH FOR MANY YEARS AND NOW LIVE IN NEWPORT, PA. I WOULD LOVE TO VISIT WITH AN AMISH FAMILY ON A FARM AND LEARN ABOUT THEIR WAYS. IT WOULD BE OF GREAT INTEREST TO ME AND I HOPE THAT SOMETHING CAN BE ARRANGED SHORTLY. why do the amish mis treat their animals so bad. they over work their horses, neglect their cows and their puppy mills are notorious for abuse, neglect and filth. how is this type of abuse ok in the amish community? I’m quite close to the Amish in Synder, Union and Perry counties in Central PA. The horses work hard at times but that is what they are supposed to do. 80% of the time they are out in pastures enjoying themselves. I grew up with using horse power on our farms and those animals were treated with utmost respect. I’ve looked for “puppy mills” and never found one. Amish do have puppies for sale at times but most of the ones I’ve seen are around $35.00 and a good home is always the prime objective. Amish beleive that animals are here to help them live the way they do and they respect animal life. HI I am trying to get Stoltzfus Contracting (Elimsport / Allenwood , Pennsylvania to come back and repair the roof his crew put on my barn with new siding last summer at over $27,000. I have left a paper message to call me on the door of his business Saturday. Yesterday I left two voice mail messages for him on the telephone and another today. Yesterday when I stopped out at his place I spoke with his son who recognized my name from the written message on the door and said didn’t he get a hold of you yet? How can I get him to make good on his business’s work and repair what has already blown apart not even a year later? I live in Aldie, VA and am wondering if there is an Amish Community that does wooden furniture repair? My husband and I are planning a visit to the US this summer and We are hoping to come to Lancaster for a day or two. We really admire the Amish way of life and were hoping we could experience staying with them instead of the usual hotels. Naturally we would respect all customs and would be willing to ‘help out’ where we can. The Amish living is Berks and Lebanon counties are not new to the area. In fact, the “Northkill” settlement was one of the first areas settled by the Annabaptists/Amish/Mennonite faiths. The “Northkill” area is in north-western Berks county (Bernville area). You still find lots of Amish and Mennonite homes in that area, especially around Mohrsville and further west around Bethel,Stouchsburg (Marion township) heading into Lebanon county. The Yoders in North America can all almost trace their tree back to 3 orignal Yoders that came to settle the Oley Valley area (Berks county)were from Steiffesburg, Switzerland – Hans, Yost (my direct Ancestor) and Christian Yoder. They all came here in the very early 1700s to practice their faiths, free from the Swiss government which persecuted anyone who wasn’t of the Catholic faith. Hans and Yost were of the Lutheran faith while while Christian was an Anabaptist. Christian left Pennsylvania and headed west, settling in Indiana eventually. (I may have some of my facts wrong, for more information about those Yoders, go to Yodernewsletter.org. 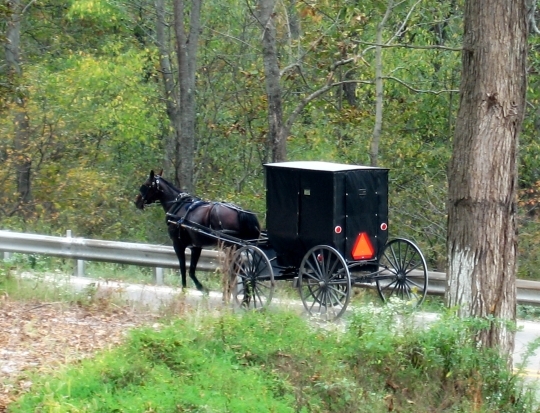 You’ll also find very many Amish and Mennonite if you head north up route 222 – from Blandon, Fleetwood to Kutztown. You are almost certain to drive by young Amish and Mennonite people and children riding their bikes along 222. I am related to both Amish and Mennonite – Yoder, Moyer, Eberly, Ebersole, Zeimer, Breyfogel, Hoch, Peters, Dreibelbis. I still speak PA Dutch- my grandparents and Dad all spoke the language fluently. When I was in elementary school (Conrad Weiser in Berks county-area covers Wernersville, Robesonia, Womelsdorf areas- and it borders Lancaster and Lebanon counties, required all students to learn German with classes beginning in 2nd grade. (you might think I am and old geezer but not quite, haha, I just turned 50) That is not a requirement any longer which I think is sad. I love my Pennsylvania Dutch heritage but there are fewer and fewer people who speak the language. If you are in Berks county, you must go to the Kutztown Folk Festival this summer for a real taste of what it is/was like to be Pennsylvania Dutch in this area. Oh and another side note – I graduated from Tulpehocken School District that covers the areas you mentioned. There were many Mennonite and Dunkard Brethren in that school. There was a Moyer boy who was Mennonite that sat behind me in homeroom that always kidded with me about marrying him so I wouldn’t have to change my last name- haha. My Favorite Place in the World.. I live in Baltimore. We travel to Lancaster on a regular basis. Part of my joy is that I’m in this beautiful place with so much history…. and it’s warm and it’s summer and there are so many things to see and do.. I would like to travel to Lancaster next week. Are there SwartzenTrubber Amish in Lancaster. Where would I find the most conservative Amish there if there are no Swartzentrubber? I am arriving in Pittsburgh, PA in a few days. I am driving from Pittsburgh to Titusville, PA. Can you help me find Amish Communities to visit while I am there between point A and point B. I only have a few days in PA. I would argue that Ohio’s Amish community is larger than Pennsylvania’s per every other site other than this one.The population is much larger and Holmes county is known as the largest Amish community in the world per the Guinness world record. Which is larger, the Holmes County or Lancaster Amish settlement? In most places you’ll probably read Holmes County is larger and going by number of church districts there are definitely more Amish churches there. “The big shocker is Pennsylvania coming in ahead of the Ohio Amish, and Lancaster County a hair ahead of Holmes County (by 25 people, which means that if Holmes County delivers more babies this week, they could retake the lead!) With the numbers at around 29,000 each, they could basically be considered the same size. However, Holmes County has traditionally been considered significantly larger than Lancaster in previous Amish population estimates. Holmes Co. was widely said to be larger before that probably because people just compared number of church districts, assuming a church district here is the same as a church district there. But after analyzing settlement-specific church directories they found that districts in Lancaster average around 165 people vs. 130 in Holmes which is pretty significant. These are estimates so the “real picture” could vary and be obscured by things like significant out-migration one year or more churches happening to divide in a given year resulting in more, but in reality smaller-than average churches, etc, so there is some imprecision baked in the cake. But looking at the numbers in a more careful way has given us a picture of two settlements much closer in size than originally thought. Going by church district numbers without this analysis can give the impression that Holmes could be even 30% larger than Lancaster, but this is not the case. Due to the closeness it’s probably safer to just say these are the 2 largest Amish communities (I have added a link to this explanation in the relevant bit of the post above). This church district size variation can make an even more drastic difference in other communities. In Indiana for example communities like Allen County and Daviess County average a very high number of families per district (in the 40s) while others in the state such as Adams Co and Nappanee much less (mid-20s). That can make a huge difference when estimating number of people, so going by church district number alone can be misleading. BTW my family came from Somerset,PA and help found Somerset Ohio so I have some background in the Amish community though the family left sometime around the turn of the century. I want to advertise a wringer washing machine for sale in NJ in excellent condition, but I don’t know where to place an ad. Is there a newspaper catering to the Amish where I can place this classified? The Budget is your best bet for placing your ad. It is a newspaper published in Ohio, but is read nationwide by Amish & Mennonite communities. Hope this helps! Perhaps you or Erik could give more information on The Budget published in OHio. My purpose is locating relatives in the Amish & Mennonite communities; especially in Pennyslvania. I believe I have seen outdated The Budget in various Amish run stores. I have fanned thru them but would like more recent info. Does The Budget give addresses for correspondence? Sorry for all the questions but I’m searching for more info. My mother and I are visiting Lancaster County in October for my birthday. Does anyone know of any Amish families that host Englischers overnight? Or any Amish-run B&B’s that I obviously can’t find online because they don’t have electricity? Hi, I have heard that there is an Amish Community in Punxsutawney, Pennsylvania. Do you know the community that I mean, or are there many around Punxsutawney? If you know the one I mean, is it possible to write a letter to them? Would they receive it and reply to it and what is there address? Many thanks! I am looking to find out if there are any Pa Amish shops willing to do an interior restoration of a 17′ Airstream RV Trailer. Floor to ceiling restoration, including cabinetry etc. No one may see this post, since it’s attached to an encyclopedic entry, but just in case…! I live in Ohio’s Amish area and was recently in a local restaurant where there was a large group of what appeared to be Pennsylvania Amish, according to coverings and other signs. The women had the heart-shaped coverings (as opposed to Ohio’s “round” shapes) and black full-body aprons where the neckline was kind of a sweetheart-shape (those aren’t worn here). I’ve seen the black “sweetheart neck” aprons before on some Penn Amish, but what surprised me was that the people were wearing somewhat bright fabric (buttercup yellow, a brighter light blue) that also had a very subtle pattern in it (looked like a very light checkerboard). Several of the families had all family members wearing the same fabric in dresses and shirts so they matched. Several of the men were wearing suspenders that also were some light colors with differing subtle patterns, like stripes or dots. I’ve never seen any Amish wear any kind of pattern, even subtle, (except for Beachy Amish, which is different). I’ve never seen any Mennonite or Amish person with that combination of the heart-shaped covering and full-body black apron (withe the shaped neckline) along with any kind of almost bright and patterned fabric. It was like a combination of Penn Amish and Mennonite in a way. Are there Amish in Pennsylvania who wear patterned fabric, even subtle, and patterned suspenders? Or maybe they were from another state and kind of moved off the “traditional” path in a small way? I am looking for experienced quilters. Any Amish paper I can place my ad in. Please help. I am trying to locate a man who bought a horse in the Ohio mix auction on May 12 2014. His name is David E Shetler from Saegerstown, Pa. The horse he purchased is very important to me. If anyone knows how I can get in touch with him just to see how the horse is doing please let me know. Thank you. I have been researching puppy mills in the Amish community and am sickened by their attitude toward these creatures of God. Yes, it is a reasonable business venture to make money on breeding animals, but the animals deserve to be kept clean, fed and well taken care of, for the return on investment if no other reason. I’m also disappointed that the authorities haven’t done more to correct this situation. Sad that people who claim to only want to live the life by Jesus’s laws and earn themselves a place in heaven can treat other living creatures so inhumanely. Sure opened my eyes to the hypocrisy in the Amish communities. I found this photo on your site. May I have permission to use it in a collage I am making about Central Pennsylvania? Are there any Amish in Franklin County, PA? I know there are some OGBB of the new conference there in the Chambersburg area. Adam as of 2013 there were 2 communities either entirely or partially in Franklin County. One is the Path Valley community, 5 churches in size, and the other is the Newburg/Cumberland Valley community, which would also be located in Cumberland County (6 churches in size). Hope that helps. Yes, there are many Amish in Franklin county. You can spot many from traveling on I81. They seem to be a spill over from Cumberland county. They have farms, roadside stands, schools and stores hidden around the country side. Amish can also be seen in Greencastle, Waynesboro and Mercersburg. Thank you Erik and Jerry, very helpful info. I’ll be driving through there this summer and I will be on the lookout. Thanks again. Looking for standardbred mare from Maine who came to pa in July 2016 at age 4. Her neck freeze brand is 1k753. If seen, please call 207 522-5865. I want to buy her. Thank you. I have seen Amish in Seven Valleys/Codorus areas but I cannot find information on their culture being in York County. There are Amish in a couple of locations in York County. I am looking to purchase unfinished primitive furniture in Lancaster and Belleville, pa.